Slide from Bannister's (standing in background) presentation. Image credit: Ship and Bunker. Argus Media's International Maritime Organisation (IMO)-compliant bunker fuel pricing assessments in Singapore are bedding in nicely, the price-reporting agency has said. Speaking at the company's refined products event held in London as part of International Petroleum Week, Asia business development manager Alan Bannister said that some suppliers had started to to use Argus assessments for IMO-compliant fuel. Suppliers want to sell at a discounted marine gasoil price while buyers prefer the high sulfur fuel oil plus price. His company's 0.5% sulfur assessment provides a solution to that conundrum. "We know the industry is going to adopt it," Bannister told the forum. "We are hoping for widespread adoption." Speaking to Ship and Bunker on the event sidelines, Bannister said that Argus is offering Singapore's buyers and sellers a new approach to market. IMO2020 will usher in a differentiated, multi-fuel market where products carry particular specifications. Different suppliers will deliver IMO-compliant fuel of varying specifications where the distinguishing factor will be the price of product. "Rather than using the cargo price, bunkers can be priced on the delivered price," he said. 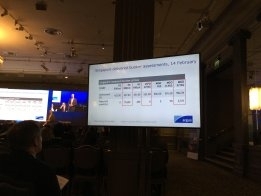 Bannister added that in his view, the cargo price is likely to move towards the delivered price rather than the other way round as the cost of blending components used to make IMO2020-compliant fuel is likely to rise on increased demand. Singapore is the world's biggest bunkering port with over a 100 bunkering operations a day. Argus Media has been publishing 0.5% price assessments in Singapore since October.